To what lengths would you go to see a good friend who can only be found in a drug-induced haze? One addict is about to find out. 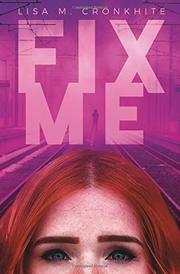 When readers meet Penelope, the white teen has been using Fix, a (fictional) once-legal antidepressant and mood stabilizer, since she started hanging out with drug-addicted Rose, a brown-skinned Latina. Pen’s ready to stop, but Fix can be a hard drug to quit: it allows users to control their hallucinations, and for Pen this includes the ghostly hallucination Nate, a fairly regular visitor since her sister’s death a year before. Logically, Pen knows the dangers of Fix; she can see what Fix is doing to Rose and has read about the health problems associated with long-term use. But can she say goodbye to Nate? Meanwhile, girls are going missing, turning her friends and fellow users into suspects. Cronkhite does much well; she captures the “I need to stop but can’t” feelings of an addict beautifully as well as the feelings of peer pressure, isolation, and depression that often accompany teenage years. The Fix addiction, Nate, and the mystery of the missing girls come to a head in the third act, and this is where the book suffers. In a rush to tie up all of her plot threads, Cronkhite undoes much of the work that makes Pen’s story so believable and compelling.